Sweet Sanity | Sweet Sanity Goes Greek! 31 Aug Sweet Sanity Goes Greek! Sweet Sanity is Going Greek! Happy September! What better time to show you our new Sorority Line. We are affectionately calling it SSU around here. 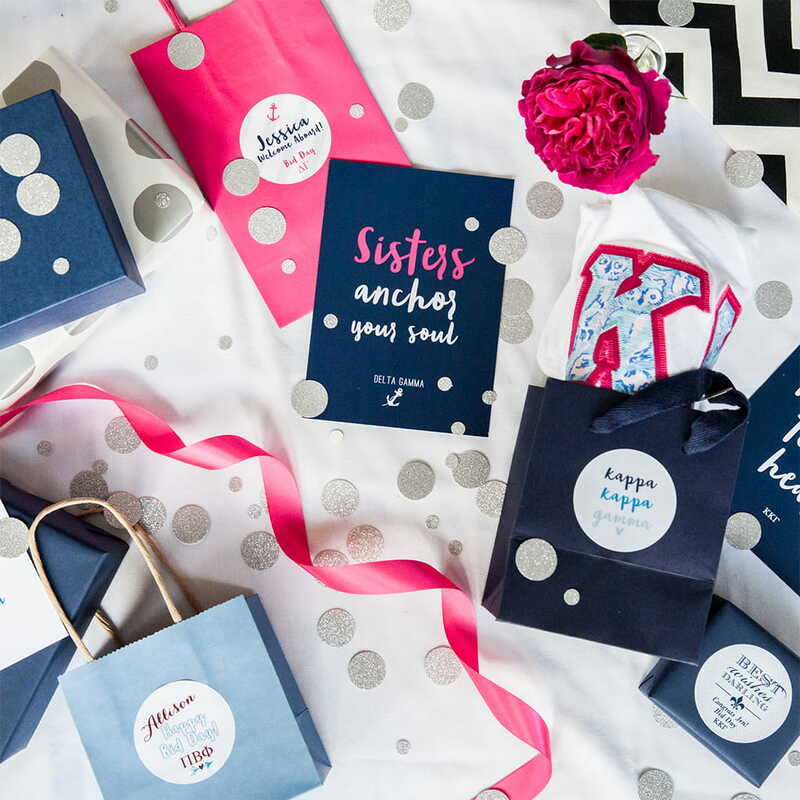 Stickers and prints to make Bid Day gift bags and sorority events chic and trendy with a touch of DIY. While my beloved Alma mater did not have a Greek system, I did have a insanely tight (and large!) gaggle of girlfriends that have stayed connected from our un-air conditioned 1950s dorm, to our oh-so-glamorous off campus housing, to now being spread far and wide across the country. Oh, and we did LOVE a good theme party so that sorta counts, right? Had a lot of fun doing my research for SSU and dreaming up ‘sisterly’ ideas! I hope our stickers for Bid Day gift bag and prints for decorating your room make this rush season a little sweeter! Below are some designs we’ve rolled out the for Kappa Kappa Gamma, Delta Gamma and Pi Phi! For Pi Phi we gave the arrow a little heart. It looks adorable framed, too. The ‘Sisters Anchor Your Soul’ print for Delta Gamma is one of my favs…who doesn’t love an anchor and it is a nod to their anchor motif! All sororities welcome! Happy Bid Day!